The cultural impact of influential Vietnam-themed films like Apocalypse Now, Platoon, Full Metal Jacket, Born on the Fourth of July and Good Morning Vietnam is so pervasive that the soundtracks of those movies—all of which made ample use of music from the Vietnam era—have arguably entrenched themselves as the de facto soundtrack of the war. When Francis Ford Coppola laid The Doors’ stark and spooky “The End” over rotor-whirring helicopters and Vietnamese jungles ablaze, he not only set the tone for his impressionistic film; he made the song and the war virtually inseparable in the minds of moviegoers whose strongest impressions of the war were formed as they absorbed Coppola’s film. Likewise, when Barry Levinson paired Louis Armstrong’s dreamy “What a Wonderful World” with a montage of police brutality and villages being bombed in Good Morning Vietnam, his choice was so effective that in addition to creating a perhaps permanent imagined connection between the song and the war, he virtually ensured that “What a Wonderful World” would be used just as contrapuntally in TV commercials for years to come. The Vietnam War looms so large in the collective imaginations of Americans of several generations that most of us tend to think of the music of the war as the music that evokes it for us. 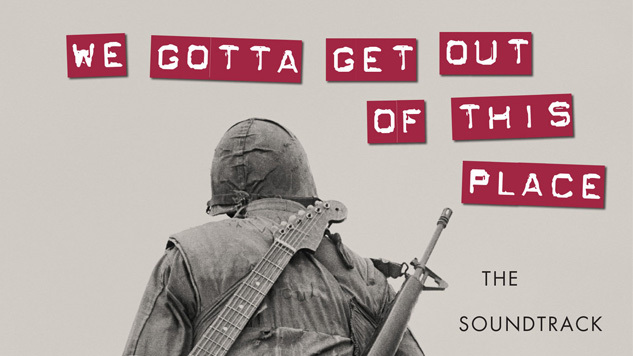 In their thoroughly researched, powerfully written and insightful new book, We Gotta Get Out of This Place: The Soundtrack of the Vietnam War, Doug Bradley and Craig Werner frame the question of which songs defined the Vietnam era in much less voyeuristic terms. Weaving together the testimony and reminiscences of a broad range of veterans—drawing on both the authors’ extensive and probing interviews and a host of poignant memoirs—Bradley and Werner explore the music that made Vietnam “the rock ’n’ roll war” through the recollections of those who fought the war and survived it. Several years back, when Bradley and Werner took up the oral history project that became We Gotta Get Out of This Place, the authors envisioned that its centerpiece would be a “Vietnam Vets’ Top 20.” As they interviewed more and more veterans, it quickly became clear that no static set of 20 songs would accurately represent the story that was emerging—and that 200 or 2,000 songs might not, either. It wasn’t just the range of songs that were popping up in the vets’ recollections as the breadth of experience associated with those songs. And if a broad swath of vets couldn’t agree on a song such as the Animals’ defiant working-class anthem “We Gotta Get Out of This Place,” Nancy Sinatra’s ever-popular “These Boots Are Made For Walkin’,” Creedence Clearwater Revival’s redoubtable “Fortunate Son,” Peter, Paul & Mary’s wrenching “Leaving on a Jet Plane” or even Country Joe & the Fish’s anti-authoritarian, pro-soldier “Feel Like I’m Fixin’ to Die Rag” (with its unforgettable “It’s one-two-three, what are we fighting for?” chorus), those records couldn’t begin to represent the range of songs that mattered to soldiers fighting the war or the reasons they did. If Bradley and Werner had attempted to build their book around a 20-song list, they would have had a much harder time trying to capture how profoundly the music that made its way to Vietnam changed between the early years of America’s involvement in the war from the 1961-1964 to the fall of Saigon in 1975. It’s staggering to consider the cultural sea changes that separated the military advisors and volunteers of the early 1960s, whose musical tastes might have run from Pat Boone to Tony Bennett to Sgt. Barry Sadler’s “Ballad of the Green Berets,” to the disillusioned draftees of the early 1970s, who arrived steeped in a youth culture defined by the escalating war at home and joined an increasingly aimless war in Vietnam. As Bradley and Werner point out, the military’s eventual surrender to the influence of popular music changed dramatically in that period, as reflected by the increasing rock-and-soul-friendliness of Armed Forces Radio Vietnam (which for years had restricted its programming to classical music and pop of the blandest sort, as depicted in Good Morning Vietnam). During the later years of the war, dissension in the ranks drove the military to initiate a policy of “hip militarism” to make army life more recreational and palatable as a way of warding off mutiny without addressing its root causes. A key part of “hip militarism” was opening the doors to rock and soul music, antiwar and Black Power sentiments and all. Perhaps what’s most striking about Bradley and Werner’s book is its balance, and the feeling for nuance that comes through in their writing and the vets’ testimony they share. We Gotta Get Out of This Place is by no means an exclusively hawk or dove’s book. Ambivalence abounds in nearly every “Solo,” in individual soldiers’ experiences and the stranger-than-fiction adventures of Vietnam pirate radio legend Dave Rabbit, and the fascinating recollections of Filipino guitarist Edgar Acosta, whose career in music began with gigs on U.S. bases in Vietnam. We Gotta Get Out of This Place concludes, appropriately enough, with a revealing and often painful discussion of the travails of Vietnam vets in the 40 years since the war’s end. The last chapter’s testimony captures how difficult the journey back to the world proved for so many, as they returned to find the country they served distancing itself from them in the shamed and humiliated aftermath of the war. Naturally, the book homes on the role music has played in that uniquely brutal phase of the Vietnam experience, both for those who found that particular songs had become a lifeline of sorts, as well as those who transmuted that experience into original music of their own. In the concluding “Solo” of the book, Vietnam vet Jay Maloney begins, “There is no such thing as one Vietnam. There were more than two and a half million of them.” No single book could capture that many Vietnams, or the multitude of voices needed to describe them, any more than you could squeeze that many singers onto a single 45 RPM record or write a song to evoke all of their experiences. But the remarkable achievement of Bradley and Werner’s We Gotta Get Out of This Place is how close they’ve come to making that many voices of Vietnam veterans heard.